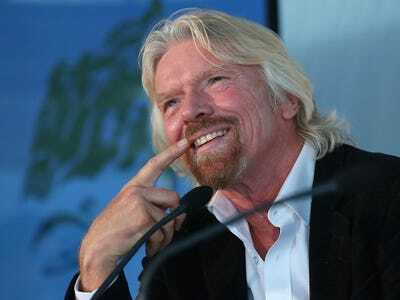 Paul Kane/GettyVirgin Group founder Richard Branson says he hates public speaking — but he manages to do it anyway. Some of the most successful people in the world have struggled to overcome their resistance to public speaking. Virgin Group founder Richard Branson says he hates performing in front of a crowd; billionaire investor Warren Buffett admits he used to throw up beforehand. Fortunately, Buffett and Branson have conquered their fears, and so can you. In fact, researchers have spent years developing different techniques for quelling the stress and anxiety often associated with public speaking. Here, we’ve listed seven scientifically tested strategies that will help you become a calmer and more confident presenter. Most people think that trying to calm down is the best way to cope with public-speaking anxiety. Unfortunately, a Harvard professor recently released a study that found that technique doesn’t really work. A better strategy is to reframe your jitters as excitement. Anxious study participants who announced that they felt excited were perceived as more persuasive and competent when they gave their speeches. That’s possibly because the first-name group felt like they were advising a friend, which is typically easier than trying to boost your own confidence. We know: It sounds obvious. But research has found that it works. In one study, people with public speaking phobias saw their anxiety decrease significantly when researchers asked them to give several five-minute speeches over the course of a few months. The catch? Those who had a negative attitude saw their phobias return a month after therapy ended, while those with a positive attitude maintained their lower levels of distress. 4. Exercise the morning of the presentation. A growing body of research suggests that working out can help reduce anxiety by changing the neurological response to stress. In other words, if an upcoming presentation is freaking you out, don’t hole up in your room and dwell on it. Instead, go for a run or a hike to minimise the impact that stressful experience will have on you. If you’re afraid of public speaking, it’s tempting to sit huddled in a corner in the hour leading up to your presentation. But by doing so, you could be undermining your own self-confidence. In her now-famous TED talk, Harvard social psychologist Amy Cuddy explains how your body language can shape your emotions. For example, making yourself “big” by standing with your legs wide and your hands on your hips can reduce anxiety and help you feel more like a leader. On the other hand, sitting hunched over can make you feel less powerful. Before you head to the stage or the conference room to give your presentation, take a few minutes to practice these power poses. 6. Rehearse the worst-case scenario. Research suggests that “defensive pessimism” can help some people manage their anxiety and perform better. Essentially, the strategy involves thinking about what could go wrong and how you’d cope. So if you’re afraid of stuttering or forgetting your lines, take some time to visualise exactly what you’d do in that situation. That way, in the unlikely event you actually do mess up during your presentation, you’ll have a better chance of recovering because you’ll have a backup plan. If your fear of public speaking is so crippling that it’s interfering with your ability to function at work or otherwise, you might want to seek professional help. Cognitive-behavioural therapy is a type of mental health counseling that helps you become aware of negative thinking, so you can respond to challenging situations in a more effective way. Cognitive-behavioural therapists have developed a range of tools to help patients deal with public speaking anxiety, including exposure therapy through virtual reality. Instead of practicing speaking in front of a live audience, patients deliver speeches to a computerised group of people. The therapist can even make the virtual group laugh and applaud throughout the presentation. Research has found that patients who undergo this kind of therapy show less anxiety when they deliver speeches to a live audience.